In The Circle Undone, the ghosts of Arkham’s macabre past have returned to haunt the city, and when word reaches you that four people have disappeared from an estate in French Hill, you have no choice but to dive headfirst into a world beyond what you know—one where spells and rituals discharge real power, and mysterious societies and covens hold their secrets close. 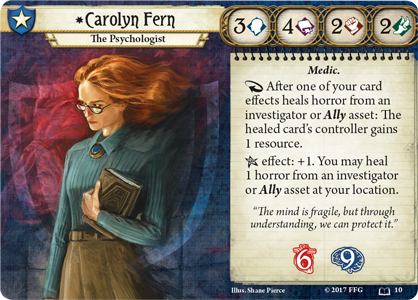 Over the past several weeks, we have met five investigators who will take up arms against the coven that resides in Arkham, but if they wish to have a chance at success, they'll need all the help they can get. 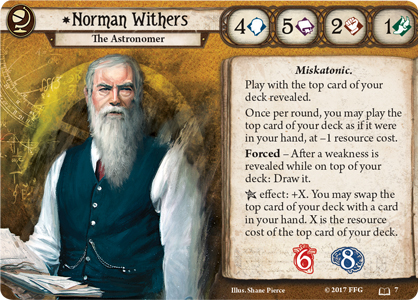 And the designers of Arkham Horror: The Card Game always have a few surprises up their sleeves. 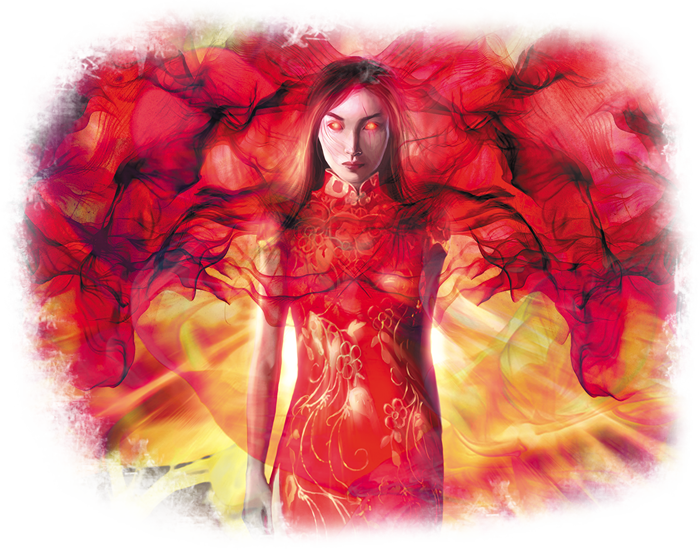 Today, we meet with Matt Newman to discuss Marie Lambeau, the sixth and final investigator to join the fight in The Circle Undone deluxe expansion for Arkham Horror: The Card Game—now available for pre-order at your local retailer or online through our website! “The Smoky Velvet” was born to sing. People said that she had the magic touch. They were righter than they knew. Marie Lambeau’s performances were no normal affair. She heard songs in her dreams, sung in languages spoken by no one on Earth. Why, she did not know. All she knew was that people called her grand-mére a witch, and there were rumors within her family that Marie had inherited her grand-mére’s magic touch. Perhaps there was more than just jazz in Marie’s blood, after all. 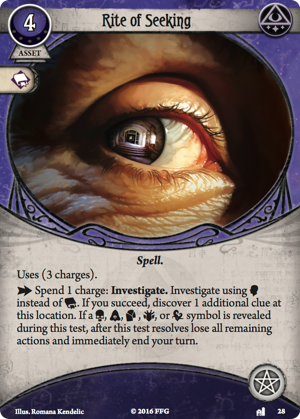 It has been quite some time since Marie Lambeau (The Circle Undone, 6) first entered Arkham Horror: The Card Game with her limited release in the collector’s edition of The Investigators of Arkham Horror book. 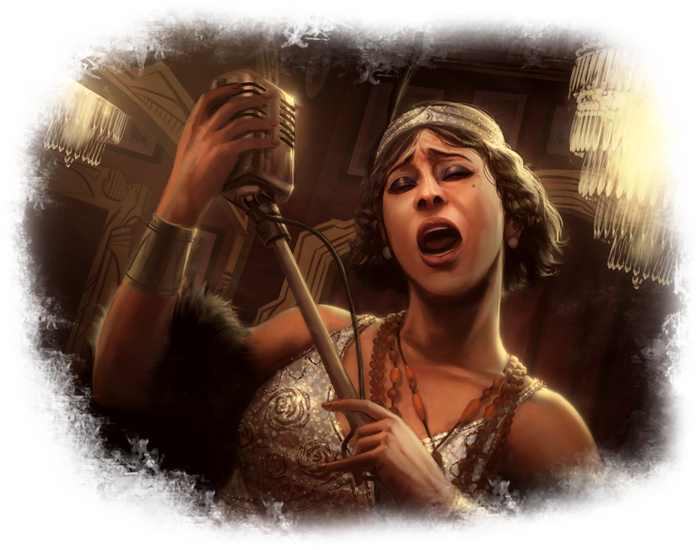 With The Circle Undone’s focus on witchcraft and black magic, we felt this was the appropriate time to finally let the jazz singer have her moment in the spotlight. When the new deluxe expansion releases, those of you who missed Marie the first time around will finally get to bring her along in their investigations. 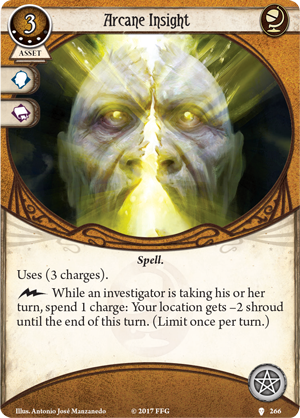 This means that The Circle Undone contains not one, but two Mystics, and six investigators in total! But will their combined magical prowess be enough to stop what is coming? 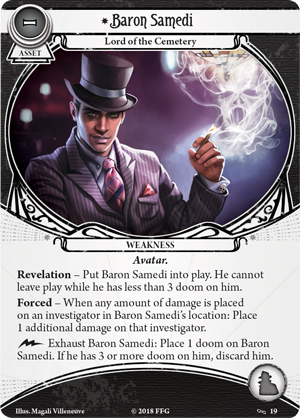 Unlike the early release of investigators like Carolyn Fern (To Fight the Black Wind, 10), Norman Withers (Ire of the Void, 7), and Silas Marsh (The Deep Gate, 13) in their respective novellas, Marie Lambeau did not have alternate art or replacement signature cards in her early release. 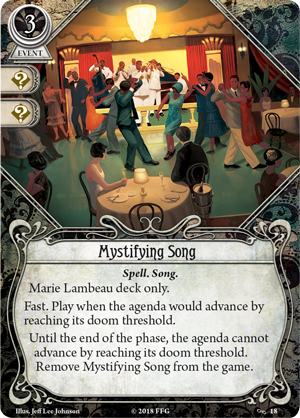 As a result, the Marie Lambeau included in The Circle Undone has the same art and signature cards as her limited release: Mystifying Song (The Circle Undone, 18) as her signature asset, and the chilling Lord of the Cemetery, Baron Samedi (The Circle Undone, 19), as her signature weakness. However, much has changed in the time since then, and she has many more tools at her disposal than she used to. With four Willpower and the ability to play or activate Spell cards as a bonus action under the right conditions, Marie makes for a great dedicated spellcaster, like many Mystics before her. 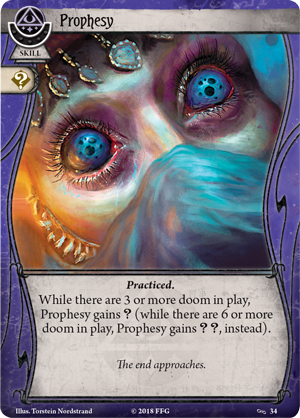 As long as you have one or more doom among cards you control, you don't need to worry about wasting time as you set up your tableau of Spell assets or activate abilities like Alchemical Transmutation (The Path to Carcosa, 32) or Clarity of Mind (The Dunwich Legacy, 30). 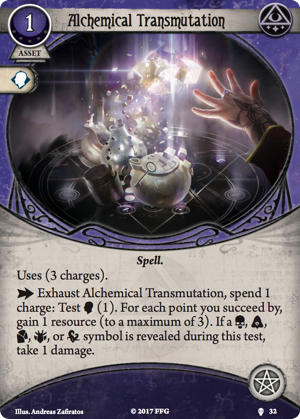 What has changed since Marie's original release, however, is the number of Spell cards she has access to. Since she has access to level 0-5 Spell cards from any class, there are quite a few cards she can access which she may find intriguing. 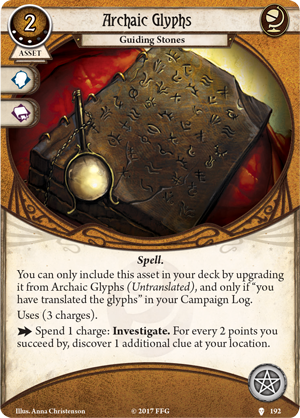 For example, a more investigation-focused Marie may wish to include Arcane Insight (Black Stars Rise, 266) or Archaic Glyphs (A Phantom of Truth,192). 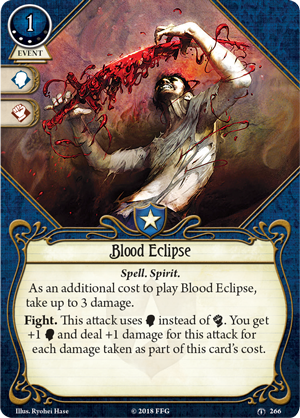 Otherwise, if you are building Marie to help deal with enemies, you can now take advantage of Suggestion (Black Stars Rise, 268) to manipulate them or Blood Eclipse (The Depths of Yoth, 266) to destroy them outright. In other words, it’s never been a better time to be a sorceress. Since Marie’s early release, there have also been several additions to the card pool which help her embrace the power that lives within her. 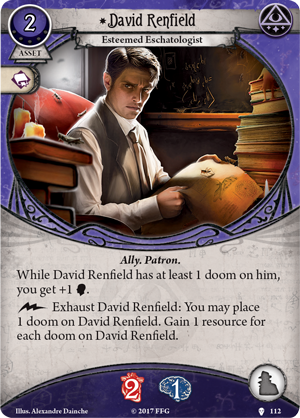 David Renfield (Echoes of the Past, 112) makes a perfect companion to Marie, with the ability to generate doom, grant her resources, and boost her willpower all at the same time. 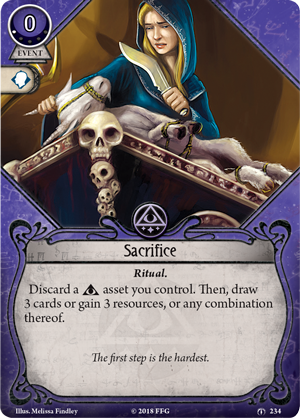 Marie can also take advantage of the level 3 Arcane Initiate (Black Stars Rise, 271) from The Path to Carcosa cycle. 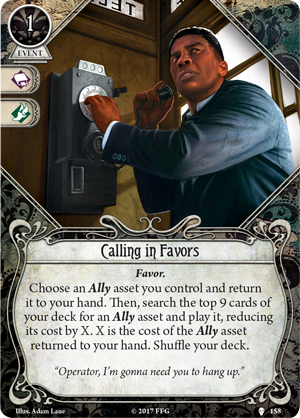 If the doom on either of these Ally assets threatens to push the agenda of the Ancient Ones forward, Marie can now use Calling in Favors (The Unspeakable Oath, 158) to swap that asset with a different one, or a well-timed Sacrifice (The City of Archives, 234) to get rid of that doom and gain some much-needed card draw or resources in the process. 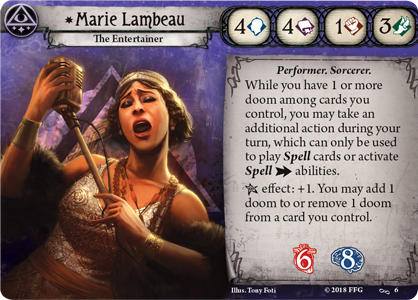 Of course,The Circle Undone contains some new tricks to help showcase Marie Lambeau’s power. Chief among them is the new skill Prophesy (The Circle Undone, 34), which has one wild icon innately and gains additional wild icons the more doom is in play. 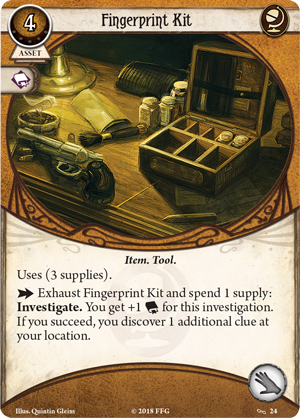 While this is perfectly usable with any investigator who has access to Mystic cards, it's a natural fit for Marie, who often puts doom on her own cards to fuel her investigator ability. Marie’s naturally high intellect also allows her to take advantage of several other cards which have released since her original appearance, as well as some new cards in The Circle Undone. 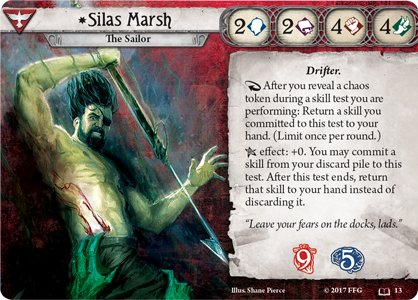 In fact, between spells like Rite of Seeking (The Dunwich Legacy, 28) and new Seeker tools like the new Fingerprint Kit (The Circle Undone, 24), Marie can be just as effective at gathering clues as any dedicated member of the Seeker faction! 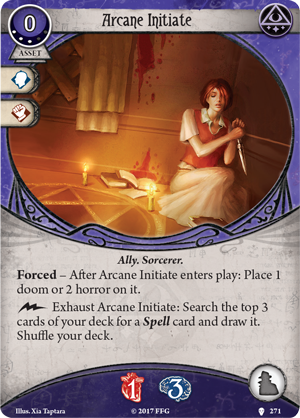 I hope players are excited to finally get their hands on Marie’s investigator card when The Circle Undone releases. 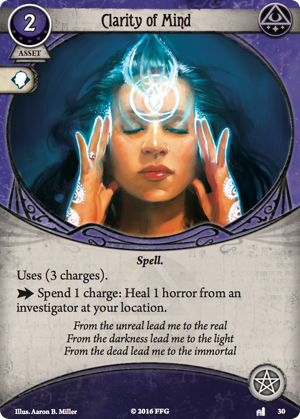 She is a lot of fun to play and should make for a powerful companion in any team of investigators! Your chance to play as the mystical singer with a velvet voice will soon arrive whenThe Circle Undone hits shelves in the first quarter of 2019. 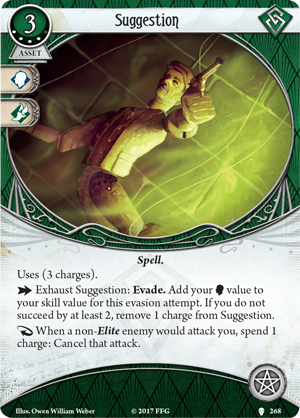 With two Mystics on your side, you may just stand a chance at defying the dark power of the coven, but will your arcane skills bring Arkham back from the brink of madness or push it closer to its doom? 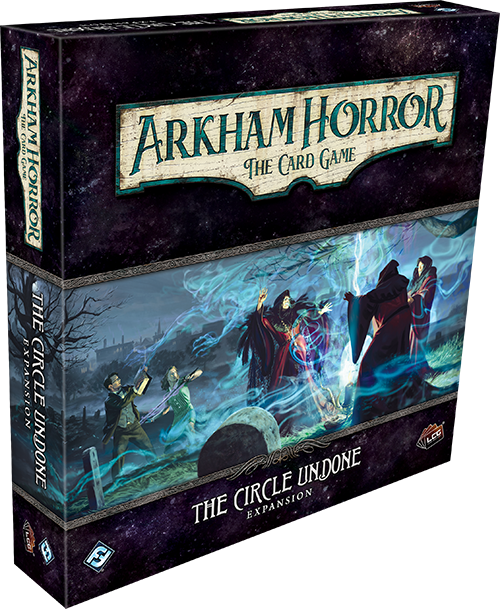 Pre-order your copy of The Circle Undone (AHC29) at your local retailer today or on the Fantasy Flight Games website here!